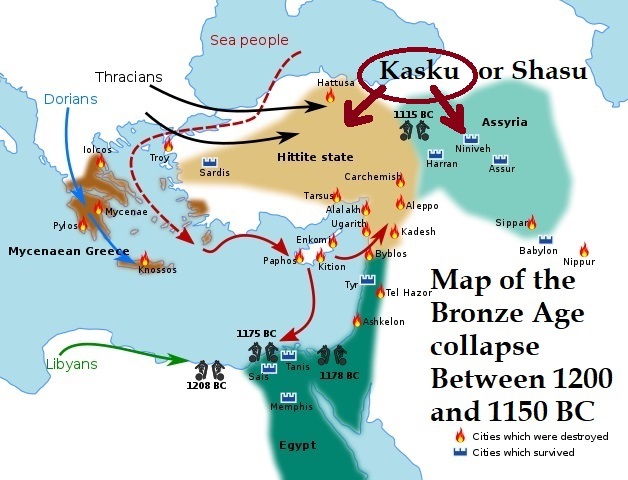 The Late Bronze Age collapse between 1200 and 1150 BC was a Dark Age transition period in the Near East, Aegean Region, North Africa, Caucasus, Balkans and the Eastern Mediterranean from the Late Bronze Age to the Early Iron Age, a transition historians believe was violent, sudden, and culturally disruptive. The palace economy of the Aegean Region and Anatolia that characterized the Late Bronze Age disintegrated, transforming into the small isolated village cultures of the Greek Dark Ages. A very few powerful states, particularly Assyria and Elam, were largely unaffected by the Bronze Age collapse but by the end of the 12th century BCE Elam collapsed after its defeat by Nebuchadnezzar I and its history is obscure for the following three centuries; and upon the death of Ashur-bel-kala in 1056 BC, Assyria went into a comparative decline for the next 100 or so years, its empire shrinking significantly, and by 1020 BC Assyria appears to have controlled only areas close to Assyria itself. Gradually, by the end of the ensuing Dark Age, the region was eventually settled by Neo-Hittite and Syro-Hittite states in Cilicia and the Levant. Beginning in the mid-10th century B.C., the Aramaean kingdoms settled in the Levant and the Philistines settled in southern Canaan. Between 911-605 B.C., there occurred the rise of the Neo-Assyrian Empire, the arrival of Phrygians, Cimmerians and Lydians in Asia Minor, Urartians and Colchians in the Caucasus and Iranian peoples such as the Persians, Medes and Parthians in Ancient Iran, and after the Orientalising period in the Aegean, of Classical Greece. In Anatolia, Hattusas, the Hittite capital, was burned (probably by Kaskians and possibly aided by the Phrygians), abandoned, and never reoccupied. Karaoğlan, [The name Karaoglan is Turkish, the original Hittite name is unknown.] near the present day city of Ankara, was burned and the corpses left unburied. Many other sites that were not destroyed were abandoned. Troy was destroyed at least twice, before being abandoned until Roman times. In Cyprus, The catastrophe separates Late Cypriot II (LCII) from the LCIII period, with the sacking and burning of Enkomi, Kition, and Sinda, which may have occurred twice before those sites were abandoned. Two waves of destruction in c. 1230 BC by the Sea Peoples and c. 1190 BC by Aegean refugees have been proposed. In Syria, during the Bronze Age Collapse, Syria became a battle ground when the empires of the Hittites, Assyrians, Mitanni and Egyptians, and the coastal regions came under attack from the Sea Peoples. Evidence, at Ugarit, shows that the destruction there occurred after the reign of Merneptah (ruled 1213–1203 BC). The last Bronze Age king of the Semitic state of Ugarit, Ammurapi, was a contemporary of the Hittite king Suppiluliuma II. Ugarit was burned to the ground at the end of the Bronze Age. Syria before this time was known as “The land of the Amurru”. Aram was a region including where the city of Aleppo now stands. At its height, Aram stretched from the Lebanon Mountains eastward across the Euphrates, including parts of the Khabur River valley in northwestern Mesopotamia on the border of Assyria. The region was known as The Land of the Amurru during the Akkadian Empire (2335-2154 BC), Neo-Sumerian Empire (2112-2004 BC) and Old Assyrian Empire (2025-1750 BC) in reference to its largely Amorite inhabitants. Aram meant “highlands”, in contrast with Canaan, or “lowlands”. Suddenly, after the Israelite invasion and colonization of Canaan, Aram became known as Eber-Nari during the new empires of Neo-Assyrian (911-605 BC), Neo-Babylonian (612-539 BC) and Achaemenid (539-332 BC). Egyptian evidence shows that from the reign of Horemheb (ruled either 1319 or 1306 to 1292 BC), wandering Shasu were more problematic than the earlier Apiru. The etymon of “Shasu” name may be Egyptian, which originally meant “those who move on foot”, “to wander”, and an alternative Semitic one with the meaning “to plunder”. Some scholars link the Israelites of YHWH with the Shasu. The earliest reference to the Shasu is in a 15th-century BC list of peoples of Transjordan. It is used in a list of enemies inscribed on column bases at the temple of Soleb built by Amenhotep III. Copied later by either Seti I or Ramesses II at Amarah-West, the list mentions six groups of Shasu: the Shasu of S’rr, the Shasu of Rbn, the Shasu of Sm’t, the Shasu of Wrbr, the Shasu of Yhw, and the Shasu of Pysps. 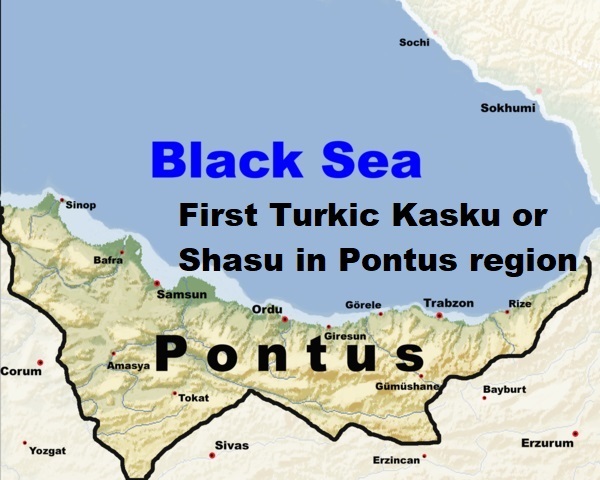 The Kaska (also Kaška, later Tabalian Kasku and Gasga,) were a loosely affiliated Bronze Age tribal people, who spoke the unclassified Kaskian language and lived in mountainous Pontic Anatolia between the core Hittite region in eastern Anatolia and the Black Sea, known from Hittite sources. 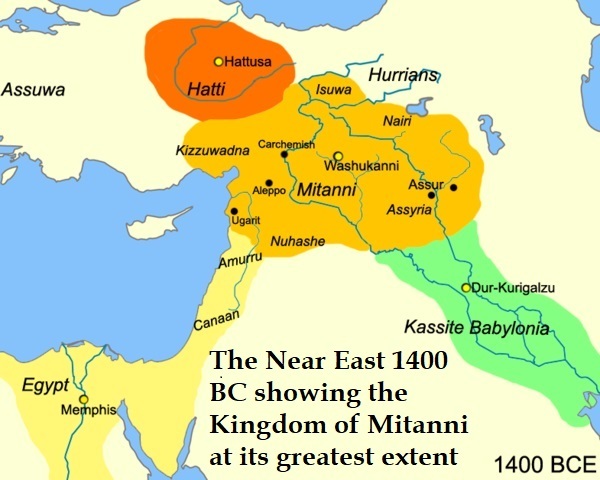 They are cited as the reason that the later Hittite empire never extended northward to that area. It is most probably that the “Kasku” of Hittite is the group of people known as the “Shasu” in Egypt. The Kaska first appear in the Hittite prayer inscriptions from the reign of Hantili II, c. 1450 BC, and make references to their movement into the ruins of the holy city of Nerik. During the reign of Hantili’s son, Tudhaliya II (c. 1430 BC), “Tudhaliya’s 3rd campaign was against the Kaskas.” His successor Arnuwanda I composed a prayer for the gods to return Nerik to the empire; he also mentioned Kammama and Zalpuwa as cities which he claimed had been Hittite but which were now under the Kaskas. The Kaska certainly caused to the fall of the Hittite Empire. Then they penetrated eastern Anatolia, and continued their thrust southwards, where they encountered the Assyrians. The Assyrian king Tiglath-Pileser I recorded late in the 12th century BC that the Kaska and their Mushki allies were active in what had been the Hatti heartland. The “Habiru” are variously described as nomadic or semi-nomadic, rebels, outlaws, raiders, mercenaries, and bowmen, servants, slaves, migrant laborers, etc. Some scholars identify them with the early Hebrews. It is quite logical that “Shasu or Kasku” were Turkic Mongolian nomads, while “Habiru or Apiru” were the Hebrew who were originally Arab Yemen Israelite. The Great Bronze Age Collapse between 1200 and 1150 BC brought these two nomadic groups into alliance against the different indigenous empires of the region. This culminated with the Achaemenid Empire (539-332 BC) in the Shasu taking over the Habiru. This decisive change created the Early Jews who displaced the Hebrew Israelites together with the Canaanite remnants.